Risk of breast cancer dropped significantly in mice when their regular diet included a modest amount of walnut throughout their life, suggests a new AICR-funded study published in the journal Nutrition and Cancer. The study compared the effects of a typical diet to that of a diet containing walnuts across the lifespan: Through the mother from conception through weaning, and subsequently by eating the food directly. 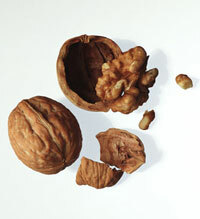 The amount of walnut in the test diet equated to about 2 ounces a day for humans. "What we found was that consumption of a walnut diet reduced mammary tumors in mice," said W. Elaine Hardman, PhD, the study's lead investigator and associate professor at the Marshall University's Joan C. Edwards School of Medicine. "The best tumor reduction was when both the mother consumed walnuts and her offspring consumed walnuts throughout life." "This is an animal study so we don't know if the findings apply to humans yet," said Alice Bender, RD, AICR Nutrition Communications Manager, "but it's interesting and it really tells us how whole foods such as walnuts might play a role in preventing cancer. "What is already clear is if people eat more unprocessed fiber-filled foods like walnuts, vegetables, fruit, whole grains and beans, they can improve health and reduce their risk of cancer and other chronic diseases," said Bender. During the study period, a test group of female mice genetically predisposed to breast cancer was fed a diet containing ground walnuts. The offspring whose diets also included walnuts developed breast cancer at less than half the rate of the group consuming no walnuts. In addition, the number of tumors and their sizes were significantly smaller. The group consuming walnuts only after weaning – the mother was not exposed to any walnuts – showed approximately one-third fewer tumors compared to the mice not exposed to walnuts. "Research shows that exposure to dietary components during times of especially fast mammary gland development makes a difference for cancer incidence," Hardman said. "We wanted to try to pinpoint the effect of walnuts on gestation as well as puberty, two times of especially fast development." The paper notes that dietary modification studies do not show whether benefits result from what is added to a diet or what is removed. In this case, adding healthy fat and other components meant that unhealthy fat was reduced to keep total dietary fat balanced in the mice. Hardman said other studies have clearly shown, however, that multiple ingredients in walnuts reduce the risk of cancer or slow its growth. Using genetic analysis, the Marshall study found that the walnut-containing diet changed the activity of multiple genes relevant to breast cancer in both mice and humans. Other testing showed that increases in omega-3 fatty acids did not fully account for the anti-cancer effect, and found that tumor growth decreased when dietary vitamin E increased. "With walnuts, as with other foods, research suggests it is likely synergism between the components that lead to reduced cancer incidence," said Hardman. Walnuts contain components that may slow cancer growth including omega 3 fatty acids, phytosterols, polyphenols, carotenoids, and vitamin E.
The findings highlight the vital role diet plays in health. "This study really underscores the importance of routinely eating whole foods where nutrients and phytochemicals all work together for better health and cancer protection," said Bender. The study was funded by grants from the American Institute for Cancer Research with a matching grant from the California Walnut Commission. Neither group had any input on the study design or findings. The American Institute for Cancer Research (AICR) is the cancer charity that fosters research on the relationship of nutrition, physical activity and weight management to cancer risk, interprets the scientific literature and educates the public about the results. It has contributed more than $95 million for innovative research conducted at universities, hospitals and research centers across the country. AICR has published two landmark reports that interpret the accumulated research in the field, and is committed to a process of continuous review. AICR also provides a wide range of educational programs to help millions of Americans learn to make dietary changes for lower cancer risk. Its award-winning New American Plate program is presented in brochures, seminars and on its website, www.aicr.org. AICR is a member of the World Cancer Research Fund International.